When the restoration started, the chimneypiece in the Large Bedroom was found to be in stable condition and did not need many repairs. The only major problem was that several pieces of composition ornament were missing. While several of the ornaments could be recast from surviving examples found on the chimneypiece, others, including the large rosette that was once found in the center of the mantel, were completely missing. 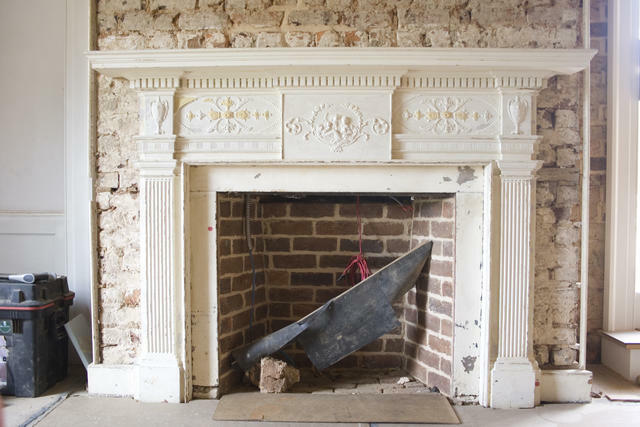 From physical evidence and a bill submitted by President Madison’s carpenters James Dinsmore and John Neilson, the Restoration Team knew that the chimneypiece dated to ca. 1812, and so the composition ornaments therefore also had to date to ca. 1812. The Large Bedroom chimneypiece before it was restored.